Home » Astana » Restaurants » Restaurant "Alasha"
For many centuries on the East there were traditions, which are observed even today, in the century of high technologies and globalization. The respect for parents and senior people, love of native land, observance of marriage customs and various ceremonies – all this form the traditions of Kazakh nation. But besides that, one of the main traditions of every eastern nation is the hospitality. 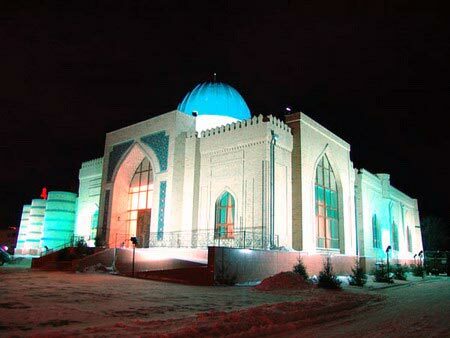 One of the followers of Kazakh traditions is the restaurant “Alasha”, which resembles the khan palace. From outside and inside it is made by masters, who recreated the carved doors of palace, relief walls, strict columns and patterned ceilings. In addition, there are several rooms, where you can relax, to smoke the fragrant hookah, and to feel yourself the royal person. Because according to the laws of eastern hospitality the guest in the house is as high person as the host, and may be even higher. And all attention of residents of the house is paid to the guest. But what does it mean “Alasha”? Alasha is the handmade carpet, which host lays, meeting dear and welcome guests. Alasha is one of the symbols of hospitality. The cuisine in the restaurant is also eastern, and visitors will meet the fragrant palov, eastern lepeshka, mutton dishes, and more than twenty sorts of shashlik. In addition, the table will be served with eastern sweets – pakhlava, sweet dried fruits and fresh fruits, grown in the bright sun of Asia. And that the meal was not only tasty, but pleasant, visitors will see the fairy dances of beauties of East. The administration and the staff of the restaurant “Alasha” work that to turn the visit of every guest into the fairy tale.